CLEAN, GREEN & LIGHTWEIGHT TRANSPORT MACHINE: FOLDING ELECTRIC SCOOTER Chances are that more and more people will be using an electric scooter for commuting purposes in the coming years. While there is a noticeable increase in people opting for shared rides on Lyft and other app-based taxi services, that type of transportation still contributes to toxic air pollution. Personal electric vehicles, such as the folding electric scooter, are becoming increasingly mainstream as conscientious citizens want to combine utility and convenience without wasting precious natural energy resources. Not only are consumers altering their daily routines to accommodate the use of environmentally-friendly electric scooters, cities are updating their entire infrastructure to provide easily-accessible battery-swapping and charging stations to the public. The variety of electric rideables is extensive, including everything from hoverboards to skateboards, but it is the electric scooters that are flying off the store shelves all over the world. BENEFITS OF RIDING A FOLDING ELECTRIC SCOOTER Contrary to a popular belief, electric scooters are designed for us by both adults and children. An electric scooter is effectively a lightweight, plug-in vehicle that provides safe, affordable commute that rivals riding a manual bicycle or walking to one’s destination. Green Alternative to Fuel-Burning Vehicles: Since electric scooters do not consume precious natural resources and run on battery power, owners find using electric scooters as a way to reaffirm their commitment to reducing the global carbon footprint. Cheaper, Cost-Effective Way to Move Around the City: A study shows that using a electric scooter costs just a penny for every mile traveled, while driving a car (including the cost of maintenance and fuel) costs more than ) $0.50 per mile traveled. Easy to Operate: Electric scooters like Urb-E’s Electric Folding vehicle are designed for easy operation with a simple plug-n-charge feature for recharging batteries. Minimal to No License Required: Since electric scooters do not reach speeds of traditional motorbikes and motorcycles, there are minimal to zero licensing requirements by local transport authorities. ALL THE COOL ‘KIDS’ ARE RIDING ELECTRIC SCOOTERS Okay, so maybe not exactly kids but millennials are shifting away from traditional car-ownership and towards more eco-friendly modes of transport. In fact, people born since 1980 are increasingly moving towards living in urban areas where they can utilize public transportation and walk as much as possible to other destinations. Using electric folding scooters, like the one by URB-E, provides an affordable, clean alternative and time-saving alternative to hitching a yellow cab taxi or waiting for the public bus on a busy weekday morning. WHY URB-E ELECTRIC FOLDING VEHICLE LEADS THE PACK URB-E’s electric folding scooter looks like something from the future- the slick, ergonomic design and deceptively small frame all tempt the onlooker for a quick ride around the block. Users have to sit down on the seat, similar to a bicycle seat, place their feet on the stunt pedals, twist the throttle (like one would on a motorbike) and off they go! Each Urb-E electric folding scooter reaches up to a top speed of 14 miles per hour and go as far as 16 miles on a single charging session. Not only is the URB-E provide a safe, cheap and fun way to travel around town, it comes with a removable Eddy power source that can simultaneously charge a laptop as well as 4 other mobile devices via USB Type C or 2.0 ports. Folding electric scooters by URB-E come equipped with leather straps for hassle-free portability; just hop off the scooter, snap it into folded position and carry it up to your office or apartment. This same lightweight frame helps an owner hop on a bus or train to take the electric scooter in for small maintenance or repair work. URB-E has an entire range of innovatively designed folding electric vehicles that promise the ultimate riding experience without the burden of frequent fuel-ups or expensive car maintenance. 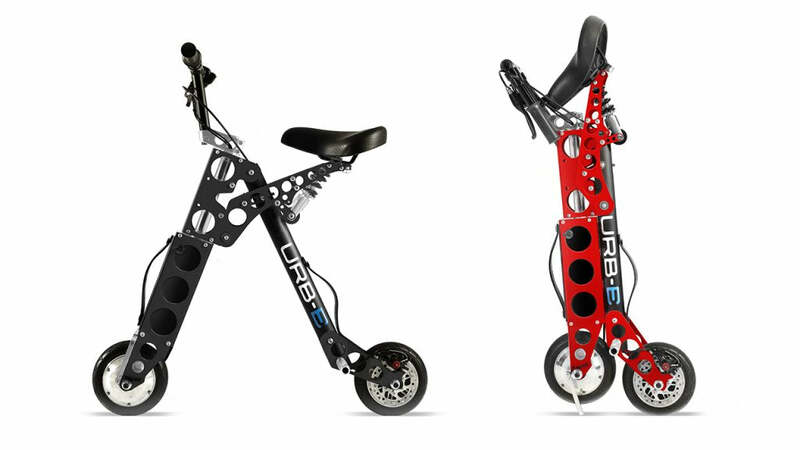 The URB-E Pro GT folding electric scooter reaches up to 18 miles per hour and provides comfortable transportation for a distance up to 20 miles.